We’d love your help. Let us know what’s wrong with this preview of The Day War Came by Nicola Davies. Imagine if, on an ordinary day, after a morning of studying tadpoles and drawing birds at school, war came t A moving, poetic narrative and child-friendly illustrations follow the heartbreaking, ultimately hopeful journey of a little girl who is forced to become a refugee. To ask other readers questions about The Day War Came, please sign up. After finishing this book I sat and thought for a while about how I felt about the story. 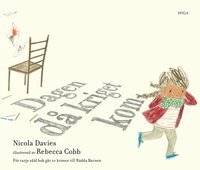 I love the idea of the book and what Ms. Davies has tried to achieve with her words, alongside the illustrations by Rebecca Cobb. However, I can’t say I feel the message will be understood properly by the ages of the children the book is aimed at. Let me explain. We first meet a little girl who is happy at home with her family, mum, dad and baby brother. She goes off to school and whilst there a war breaks out. She finds what is left of her home, just a blackened hole and so she is all alone. She tells us about her journey in which she ran, walked, rode on a truck and then on a boat that nearly sank. She then ends up in a place full of huts. She talks about how the war has gotten underneath her skin, behind her eyes – would a little child really think like this? She doesn’t state any feelings towards losing her family or being alone. There is no mention of her being scared. She then peaks in the window of a school and wants to join in the class but she is told by the teacher there is no room for her, there is no chair. Then a little boy brings her a chair and she starts to feel happy. I so wanted to like this book as I believe that children need books that are not all lovely and beautiful and full of fun, I believe they also need books that tell them what is really happening in the world. This feels though like it hasn’t been written for little children, more an adult writing about a child for other adults to read. Gosh, I hope I’m making sense. There is no mention of where the little girl lived – children will want to know this. There is no mention of her family and what happened to them – children will want to know this too. No mention of her feelings, of where she ended up, of who is now looking after her – There are questions children will want to know the answers to. I noticed at the back that Ms. Davies has explained how she originally published it as a poem on the Guardian Newspapers website and how well received it was, even having lots of people taking photos of empty chairs. As I stated above, this story is for adults, hence the reaction her poem got on the site. 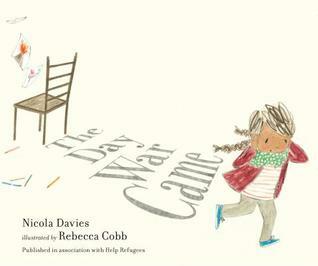 The Day the War Came is a picture book featuring a poem written by Nicola Davies in response to the UK refusing to give sanctuary to 3000 unaccompanied child refugees. Beautifully illustrated by Rebecca Cobb, it tells the story of a little girl having breakfast with her parents and little sister on the day the war came. Then she goes to school and learns about volcanoes and draws a bird and then the war came in the form of bombs blasting her former life away. Everything changes, of course, and she has no context for understanding what is happening. She runs, she hides, no one wants to take her in. One day she finds a school, walks into a classroom, but they say they have no room to take her in because they don’t have enough chairs. But the next day someone brings a chair for her. She’s a refugee, one of the 22.5 million refugees on the planet right now, mostly driven out of their homes by war and famine, and more than half of those refugees are children. This book was like a kick in the gut for me as we tear-gas children and families here in the US at the border of Mexico seeking asylum. May we consider choosing love, instead? May we find a way to provide chairs for them? This story prompted the #3,000chairs project which I invite you to explore on Twitter. Maybe Instagram, too. A simply told yet powerful picture book about the innocence of childhood and a world torn apart by the advent of war. This is all about the loss of the world that we once new, the loss of family and the difficult journey of a refugee traveling towards a new country. 'The Day War Came' is about the real human cost of war through the eyes of innocence, through the eyes of a child - it's about the search to find welcome. This is a well written, moving and important book - it's a story about toleranc A simply told yet powerful picture book about the innocence of childhood and a world torn apart by the advent of war. This is all about the loss of the world that we once new, the loss of family and the difficult journey of a refugee traveling towards a new country. A devastating book that does a beautiful job of illustrating how war can come to anyone at any time and what that must be like. A devastating book to help develop understanding and open hearts. "Recently the United States limited the annual number of re A devastating book that does a beautiful job of illustrating how war can come to anyone at any time and what that must be like. A devastating book to help develop understanding and open hearts. Words are not enough to describe how affecting this story was for me. I am utterly overwhelmed by Davies and Cobb’s destructive depiction of the arrival of war. Told from the perspective of a child who loses everything and everyone. War takes it all, along with a part of herself that will never be regained. This happens on an ordinary day and could have happened anywhere- life is so fragile and easily torn apart. There is a devastatingly powerful partnership between words and illustrations in th Words are not enough to describe how affecting this story was for me. I am utterly overwhelmed by Davies and Cobb’s destructive depiction of the arrival of war. Told from the perspective of a child who loses everything and everyone. War takes it all, along with a part of herself that will never be regained. This happens on an ordinary day and could have happened anywhere- life is so fragile and easily torn apart. There is a devastatingly powerful partnership between words and illustrations in this, the image of the ‘blackened hole’ that remains of her home is etched in my mind, and shows a desolation that I will not forget. This story sounds an urgent call for humanity to care for each other. Davies wrote her poetic narrative after the UK failed to shelter 3000 unaccompanied child refugees. Despite escaping conflict in her own country, war is not tied to location. The protagonist finds herself adrift in a different type of fight, one in which compassion and empathy struggles against prejudice, and basic responsibility for those in need is neglected. Accompanying the physical hole in the war-torn country is one in the soul of society. This child is desperate and alone, and yet people so willingly turn away from someone in the midst of crisis. A book that truly highlights the cruelty of this, the reader’s heart will bleed for the undeserving victims. Sharing this story with children is key to developing an empathy that the world is crying out for. It is children that offer a glimmer of hope in the final pages of this tale, who fill the absence made by adults. In gaining understanding of the horrors experienced by refugees, efforts can be made to building a bridge between different communities and eradicating conflict within countries that ought to be offering peace. A truly beautiful story that I love more with every read. Goodness me this poetic picture book is so moving. It is dark, as it should be, but ultimately tells an uplifting and hopeful message. War has struck. A little girl is no longer welcome at school. She is the same as all the other little boys and girls inside, but the teacher will not let her in. There is no chair for her to sit on. She is not the first, or last, little girl for this to happen to. But she should be, and she could be, if more people take the time to read stories, poems, or message Goodness me this poetic picture book is so moving. It is dark, as it should be, but ultimately tells an uplifting and hopeful message. War has struck. A little girl is no longer welcome at school. She is the same as all the other little boys and girls inside, but the teacher will not let her in. There is no chair for her to sit on. She is not the first, or last, little girl for this to happen to. But she should be, and she could be, if more people take the time to read stories, poems, or messages of this nature. I think it is amazing how Davies, who ordinarily writes very happy and beautiful stories filled with colour (she is a firm favourite gracing the shelves in my house), has chosen to speak out for those children who are neglected, silenced and who, through no fault of their own, cannot have the same privileges and the same safety as others who War may not have affected yet. It's a chilling story which takes more explaining to a smaller reader than is always comfortable, but why shouldn't we challenge the norm of picture books? Let's tell important messages to our children, to advocate for other children who are so like them but who don't have an adult to read them a story. It takes some explanation, some of which may be missing from this book, but it certainly was a story which needed to be told. This book should be in every classroom! It does such a good job of introducing children to issues they may be hearing about in the media and humanise the individuals who are suffering from the effects of war, rather than lump them all together under the label of 'the refugee crisis'. It is based on a poem, originally written by the author in response to hearing of refugee children being turned away from schools because there were no seats for them in the already-full classrooms. People don't ask This book should be in every classroom! It does such a good job of introducing children to issues they may be hearing about in the media and humanise the individuals who are suffering from the effects of war, rather than lump them all together under the label of 'the refugee crisis'. It is based on a poem, originally written by the author in response to hearing of refugee children being turned away from schools because there were no seats for them in the already-full classrooms. People don't ask for war to come to their doorstep and destroy the places and people they love. People don't ask to be forced to flee from their home and history and make a perilous journey with an uncertain welcome at the end. It shouldn't need to be said or explicitly taught, but it is important for our children to realise (and for us adults to remember) that refugees are first and foremost individuals just like us, with the same wants and needs and we should be doing everything we can to help. Such a powerful picture book. 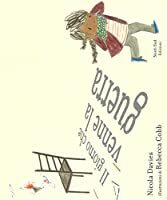 This book tells the story of a small girl who lives quite happily with her family until the day the war comes. Then her life is turned upside down. Her classroom is destroyed and her town is turned into rubble. She has nothing left, no family, no home and she begins the treacherous journey to find somewhere safe to stay. She crosses over roads, fields and mountains and travels in trucks, buses and a boat that almost sinks until she reaches a a row of huts. The huts are desolate but they are all that she has. The little girl walks on and on until one day she finds a school, she peers through the window and sees children quietly sat at desks and she desperately wants to join them but the teacher tells her that there is not a chair for her and turns her away. The little girl sadly goes back to her hut but then a little boy appears holding a chair. Now she has a chair the little girl can go to school. Sweet and painful, Nicola Davies' prose dances all night long with Rebecca Cobb's illustrations in this graphic book that was originally a poem. The ending, while hopeful, only presents a stark picture of what kids and adults alike suffer when war tears apart holes in their lives. A poignant refugee story gracefully written with child-friendly illustrations. No punches pulled here. This is the impact war has on small children all over the world. I loved this, in that aching joy and sorrow way that comes with all my favorite picture books. The prose was sparse but beautiful, and the illustrations were both lovely and haunting. This would be a good book to read with a child to inspire discussion about war, safety, and kindness. I already need to read it again. Absolute killer. Keep the tissues nearby. So simple and so incredibly sad. If you could ever say there is a good book to introduce the concept of war and refugees to children it would be this one. Heartbreaking. Be sure to read the afterword. British children's author and poet Nicola Davies turns to the difficult subjects of war and refugees in this powerful picture-book, which takes as its text the poem on the subject that Davies first published in The Guardian. Describing the life of a young girl, and how it is interrupted by war, the narrative follows its subject as she flees across land and sea, eventually coming to an unwelcoming place. 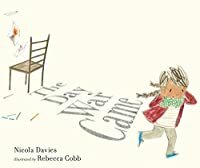 Will she ever find a home again - will she ever live somewhere that war doesn't permeate life British children's author and poet Nicola Davies turns to the difficult subjects of war and refugees in this powerful picture-book, which takes as its text the poem on the subject that Davies first published in The Guardian. Describing the life of a young girl, and how it is interrupted by war, the narrative follows its subject as she flees across land and sea, eventually coming to an unwelcoming place. Will she ever find a home again - will she ever live somewhere that war doesn't permeate life itself...? Davies is a poet indeed, and having greatly enjoyed her recent (at least, recently published here in the states) King of the Sky , I went into The Day the War Came with high expectations. I was not disappointed, as the narrative here is intensely moving, and thought-provoking as well. Davies has the occasional turn of phrase - "I can't say the words that tell you / about the blackened hole / that had been my home" or "But war had followed me. / It was underneath my skin, / behind my eyes, / and in my dreams" - that pierces the heart. The accompanying artwork by illustrator Rebecca Cobb, done in pencil, colored pencil and watercolor, is powerful as well, capturing the peaceful calm of the girl's life, and then the utter destruction and desolation that war and flight brought to her. This is a moving book, and I think that for children who might have questions about some of the news they may have seen on television, or heard discussed, it might make a good title to launch discussions about war and refugees. I am mindful that it might not be developmentally appropriate for very young children, a concern raised in my friend Hilary's excellent review, but for those already aware of these issues, and seeking answers, this might be a useful story. Paired with the aforementioned King of the Sky , which is about an immigrant, rather than a refugee, it might make a good starting place for a discussion of the complexities (and yes, despite the simplicity of this moving story, it is a complex issue) of human migration issues. A paragraph on the rear dust-jacket, as well as the author's brief afterword, alerts us to the fact that this poem was written in response to the refugee issue in Europe, that in fact, the author and her friends have established an organization, Help Refugees, to aid people fleeing war. This book, the front cover informs us, was published in association with Help Refugees. Published in association with Help Refugees, Nicola Davies shares a poem she wrote when she learned that 3,000 unaccompanied children had been turned away by the U.K. In an author's note, she adds that there are 22.5 million refugees in the world and over half are children. This story/poem tells of a young girl who went to school one morning only to have 'war come' after a few hours. Her town is bombed; her own home destroyed. She is the only one left in her family, so she runs. The story is bri Published in association with Help Refugees, Nicola Davies shares a poem she wrote when she learned that 3,000 unaccompanied children had been turned away by the U.K. In an author's note, she adds that there are 22.5 million refugees in the world and over half are children. This story/poem tells of a young girl who went to school one morning only to have 'war come' after a few hours. Her town is bombed; her own home destroyed. She is the only one left in her family, so she runs. The story is brief, showing a few pages of the harrowing and continual moves from place to place, camp to camp. Davies writes the girl has only a dirty blanket and a corner with "a door that rattled in the wind". She walks along a street and people ignore her. The heartbreaking moment came to Davies when she read of a child turned away from school because they told her there was no chair for her. What happens at the end both feels very good and still sad to me. A young boy comes to this fictional girl and says he has a chair for her. All of the children, I assume at the camp, are going to school! And they each bring a chair. In soft, I think, watercolors, Rebecca Cobb manages to show the scope of this war, the family in an ordinary day, the child who within hours loses everything, the bleak destruction of a child's life. I think this book is the hardest book I've read for a long long time, told by a child it details how quickly war can enter your life and the destruction it continues to bring with it. This book started as a poem by Davies and was published on the Guardian's newspaper website before being turned into a picture book. Visit helprefugees.org to learn more about their work and how you can help support refugees and children across the world. Truly one of the more heartbreaking picture books I can remember reading, and I think very important. Obliquely about the Syrian refugee crisis, I thought it was interesting that the main character was clearly brown but lacked any clear cultural or religious markers that would signal difference to Western, Christian children. This picture book is a reaction to a British event in 2016 when 3000 unaccompanied refugee children were denied sanctuary and a story of one child who couldn't attend a school because there was no chair available. Nicola Davies and Rebecca Cobb have presented the story of one child, through her eyes, of the coming of war during a normal school day and the telling aftermath of loss, destruction, aloneness and isolation. The explanatory text at the end provides the background for creating this sto This picture book is a reaction to a British event in 2016 when 3000 unaccompanied refugee children were denied sanctuary and a story of one child who couldn't attend a school because there was no chair available. Nicola Davies and Rebecca Cobb have presented the story of one child, through her eyes, of the coming of war during a normal school day and the telling aftermath of loss, destruction, aloneness and isolation. The explanatory text at the end provides the background for creating this story. The protagonist’s expression, the symbolism of chairs, the role of education as providing stability... Gosh, this is a powerful little book, in which the children’s compassion provides both a resolution and a challenge. Simple, moving, cleverly told. This book is devastating and made me cry but it is so important and sparked a real conversation with my daughter. Add this to your refugee text set. First written as a poem and then turned into this heartbreaking, breathtaking book. Add to your text sets on refugees. How the Devestation of war affects a young child. This is an interesting book with a great message. ‘The Day the War Came’ is around A4 in size and is a hardback book with thick matt pages inside with some lovely colourful images inside and text. This story of this book is an important one to share with children although they may not fully understand it without some help. The book begins with the little girl sitting at home with her family. We never know the girls name but she narrates the story. As the girl goes to school she does things that This is an interesting book with a great message. ‘The Day the War Came’ is around A4 in size and is a hardback book with thick matt pages inside with some lovely colourful images inside and text. This story of this book is an important one to share with children although they may not fully understand it without some help. The book begins with the little girl sitting at home with her family. We never know the girls name but she narrates the story. As the girl goes to school she does things that children normally do, learn things, sing songs and draw pictures, but while at school war comes. The story becomes sad with the war destroying her school and everything around her. She then flees, with others, to another country, but it’s not the safe and welcoming place she thought it would be. The story is obviously of a refugee child and the terrible and devastating effects of war for all refugee children. The girl’s story continues (I’ll explain the ending here) with her being all alone and unwelcomed by everyone she sees. People ignore her on the street and when she finally spots a school where children are having the same fun she used to have, learning things, singing songs and drawing pictures, she wants to join them, but the teacher refuses to let her in the classroom because there is no chair for her. The girl goes back a refugee camp and hides away until a boy from the school enters her room and brings a chair so she can go to school. While the tale is sad and the pictures in the book reflect this, there is an uplifting ending which overall made me smile after reading this book and I felt it was a good book to read. At the back of the book there’s an explanation of why the story was written, with the school chair incident being based on something which has really happened. There is also an explanation of how this story was first published as a poem online. The pictures in the book are all lovely and well drawn. They all look like pictures a child has drawn which makes this story all the more powerful. I like the way the pictures of the war are shown, there’s no real detail but you still get the sense of how horrible it is by the way the whole page is a mass of grey. And I like the way the emotions of the girl are shown, so happy at the beginning with sadness but then happiness again at the end. It’s the pictures that I found more powerful than the actual story. Children will need someone to help them understand this tale, however it’s still very understandable by the pictures alone and the whole story does make sense and has that happy ending. It would make a great book to buy to approach this subject with children, especially as this is a reality in our world. The uplifting ending, with a back page showing the girl sitting happily on her chair, make this tale far less sadder than reality is, and it would make a great book to read to kids at school, to discuss this further. do like this book and think it’s a great way of showing kids the realities of what is happening in the world, but also giving them a good message of hope and how we can all help in the end. I’d recommend this book although it should be one that isn’t left to kids without first discussing/explaining it to them. Another great things is that the book is endorsed by Amnesty International and every book sold gives a £1 to the charity making me want to recommend it even more. Jedna z obrázkových detských kníh tématizujúcich vojny a migráciu, vylúčenosť imigrantov, problém nájsť si miesto v novom svete. Veľmi oceňujem, že okrem "všeobecného" motívu dieťa - vojna - útek - nová krajina - samota obsahuje aj "konkrétnu" epizódu, ktorá však veľmi dobre funguje ako spôsob, ako si čitateľa pripútať bližšie. O to viac, že je inšpirovaná skutočnou udalosťou.